Feeling kicked in the stomach due to non-payment of salaries for almost a year employees of NC Hills Autonomous Council on Saturday sat at the Haflong cultural hall complex for auctioning off their household goods including their children’s toys. They decided to put their belongings in the bidding process to save their families from starvation. 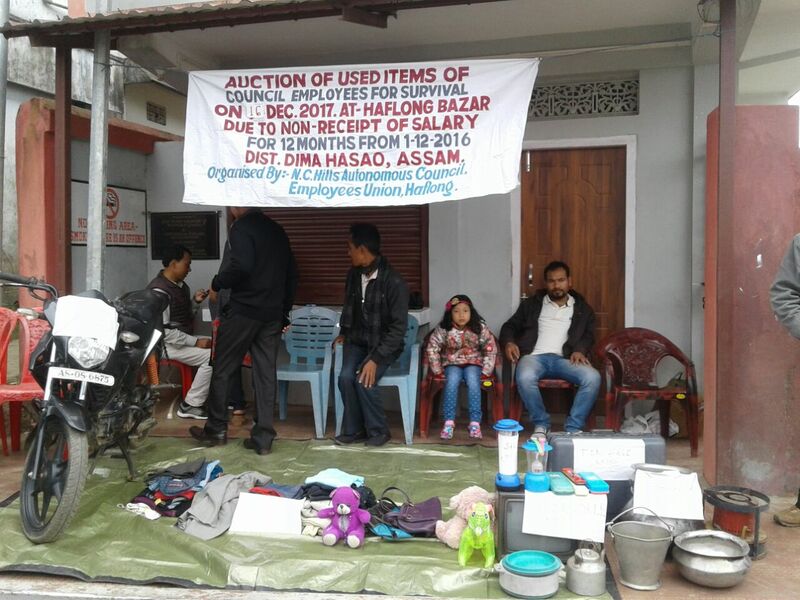 Non-release of salaries by the Dima Hasao Autonomous Council for the last eleven months has put the lives of its employees in difficult conditions. The situation has come to such a pass that a fourth grade employee namely Putul Giri had committed suicide earlier in the month of April. Many students who are studying outside the district as well as the state have to return home in the midst of their studies as their parents are now unable to bear the educational expenditure due to non-release of salaries. Teachers of elementary education, employees of forest department and other normal sectors are at a loss due to financial crisis they are facing since January this year. The incident has exposed the sorry state of affairs in the council which has failed to release the salaries of the employees since January this year. Things have come to such a pass that some of the employees have launched a campaign ‘Betan Deu’ means give us salary in the social media which has become viral. Even one youth namely Daniel Langthasa with a guitar in his hands launched a campaign through his songs for releasing the salaries from New Delhi to news studios in Guwahati. Talking to NE NOW an elementary teacher said despite the fact that BJP is in power both in the state and the council their plight has remained the same as they are yet to see the ‘Achhe Din’ or good days in their lives. Some of the employees are of the opinion that due to its failure, the council should be dissolved.